One of my greatest thrills when I was young was listening to ghost stories around the campfire. I remember a popular theme in those stories were tales of seemingly inexplicable lights floating... lights that were actually spirits from beyond the grave. I am no longer a child, but those tales still fascinate me. They always involved an unrested spirit, usually of the Kickapoo and Illini nations that once roamed the area I live in. In these accounts, the spirit was angry and vengeful, seeking retribution for their burial ground being desecrated. Many of these stories are just that... something strange may have been sighted, and a legend was born, growing over time. However, there are documented cases all over the world of these bizarre light forms. Scientifically, these lights have been shown to be gasses coming from the ground, or the more rare phenomenon of "earth lights" that show up around fault lines. Does this explain all of the sightings? It's quite likely they do... and yet the interest and speculations continue. Accounts of these strange lights go back to before Biblical times... when people felt they were getting a message from God or higher beings. These weren't generally attributed to ghosts... rather it was believed that something celestial or divine was at work. In the tenth century A.D., one of the first English Kings known as Edward the Martyr was quite possibly murdered by his own stepmother. It is said that a year after his death, the sky over the area where the body was supposed to be hidden lit up with a strange orange light that almost seemed to be a ball of fire. More recorded sightings appeared throughout the 11th and 12th centuries, especially in Europe. 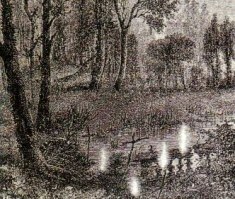 These strange balls of light came to be known by such phrases as "Will-o'-the-wisp" or "corpse candles". Even the jack-o-lantern we all enjoy as part of Halloween has roots in the legends of these lights. Often, they simply appear as one, but there are many incidents reported of there being several. These lights gave speculation not only of ghosts, but of extraterrestrials as well. Many local legends all over the world have stories about the lights. Some involve a railroad worker who was tragically killed by an oncoming train and now walks the tracks represented as a bobbing light. Others speak of vengeful spirits from the nations indigenous to the United States. Many reputedly haunted cemeteries and abandoned wastelands also have accounts of these floating orbs. Along with these legends are well known documented cases of what have come to be known as "ghost lights". One case that led many to speculate the possibility of these lights having an extraterrestrial nature was the Nuremberg incident of 1561. It is said that in early April, spheres of light shot across the atmosphere, along with shapes of cylinders and crosses. 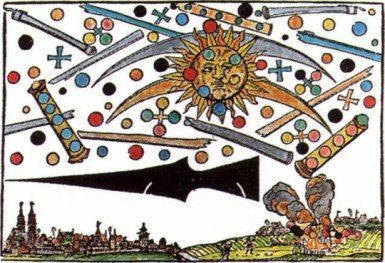 As depicted in a woodcut (before photography, a way to record an image by carving it on a block of wood), it appeared there was a celestial battle going on right before the shocked townspeople's eyes. Another early documentation of such phenomenon occurred in Cardinshire, Wales in 1656. These lights appeared to have been more of a "ghostly" nature, as they were round spheres of light that circled around in the area of the town, and sometimes even inside the homes themselves. A man named John Davis wrote these incidents down as they happened, and there were many superstitions that the balls of light appeared before someone in the town died. Throughout the next several hundred years, accounts of seeing these lights would continue. There were variations of course... some were small globes of white seen floating in almost a bobbing fashion, and others were bright orange spheres that appeared ominously in the sky or near the ground. Many of these incidents have gained national attention in the last century. One of the most famous of these would be the Marfa Lights in Texas. If you travel down U.S. Route 67 in the state of Texas, pay special attention when you are close to Mitchell Flat. This area, just to the east of the town of Marfa is home to many accounts of strange, brightly glowing spheres of light. The lights are reported as either hovering close to the ground or being up higher in the air. While there are no documented cases of this before an article in 1957, it is said that the stories of the lights had been passed down since the later 19th century. The article, called "The Mystery of the Texas Ghost Light" was written by Paul Moran, and was featured in Coronet Magazine. One fact of this particular case needs to be noted however...when a group of students from a psychic's society studied this phenomenon, they found that the traffic from U.S. Highway 67 can be seen from the area where the lights have been reported. It is also noted that the study was conducted southwest of the reported viewing area, which only explains the lights that are seen in that particular spot. Explanations such as extreme temperature changes in this region creating mirages, or the thermal expanding and contracting of the quartz in the area causing a voltage effect over time have also been examined. Whether there is a natural explanation or not, the people of Marfa enjoy their notoriety, and have the Marfa Lights festival every year. Hessdalen Valley lies in the heart of Norway, and is home to many sightings of strange lights. These accounts began in the latter part of 1981 and continued through the middle part of the decade. The reports were so numerous that an investigation, called Project Hessdalen, was launched in 1983. A studied observation of the phenomenon happened in the early part of 1984. During this, fifty-three recorded sightings of these lights occurred in a time frame of just over one month. Another investigation in the later part of 1985 yielded no recorded results. In 1998, technology came into play and an automatic measurement station was placed in the Hessdalen Valley. This records any data that shows up so that it can be analyzed. There are still sightings of these strange spheres of light in this area, but they have decreased to a little more than a dozen each year. In the possible explanations for these sightings that seem to occur at random and in all different areas of the world, logic and reasoning must be applied. Some of these lights can be attributed to simple gasses that come from the ground, especially in damp or marshy areas. Phosphine and methane naturally occur in ground that is decaying from the inside. When these gasses come in contact with the air, their appearance can be that of a glow or a shimmer... often appearing in spherical form. In 1993, Drs. J.S. Derr and M.A. Persinger, two professors, took a book written by Paul Devereux in 1982 called "Earth Lights" a step further. The tectonic strain theory offers that the earth itself holds the explanation to these lights. Minerals such as quartz or arsenic that occur naturally in the ground produce an electrical charge. This is noted especially along fault lines. When these strains occur, rocks and soil increase in temperature, turning any water into vapor. If the heated area contains any of these minerals that produce electricity, it is thought that the charge itself could move through the vaporized water... causing a ball of light to appear. Other explanations vary from types of biological fungus from the ground that emits a glow, to ball lightening occurrences, to simple light reflections that optically appear to be coming from another location. Another famous case, the Paulding Lights of Michigan, have been theorized by some as reflections of headlights from the highway that runs along side where most of the sightings are. A lot has been learned about what can cause this strange phenomenon to happen. However, that doesn't lessen the interest or fascination with these lights when they are seen. Many have been explained... a few are still puzzling those who study them. One thing is for certain... the earth is full of mysteries that we are only beginning to comprehend. Written by Angela Sangster, Copyright 2010 TrueGhostTales.com all rights reserved.